This Friday is for fixed. And for making! | carpe diem! This Friday is for fixed. And for making! 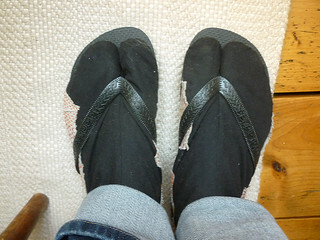 I finished repairing my tabi earlier in the week, and immediately bought a pair of flip-flops to protect the repaired surfaces, because I think they’re beautiful. I might even Pin(terest) my own work. The spiralling stitches were much faster to work than the blocks, but that might have been because I wasn’t fiddling about deep inside the sock. 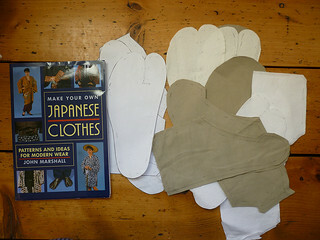 Having repaired them, it was time to think about making my own from the pattern and instructions in John Marshall’s book. More bits of my husband’s old trousers, plus some light white cotton sheeting for lining and heavier white cotton, almost canvas, for the outer soles. I found kohaze (the fasteners I need) on Etsy(!) and have ordered enough for two pairs of tabi. 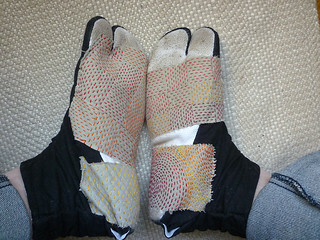 I’ve been Pinning images of tabi, paying special attention to those with sashiko stitched reinforcement or repair. I will embellish this pair, but have to decide whether the stitching should be done before assembly (far easier) or after (the stitching could be used to add shape to the structure). Decisions, decisions, but I don’t have to decide now. First I have to make muslins, as it were, testing the fit. 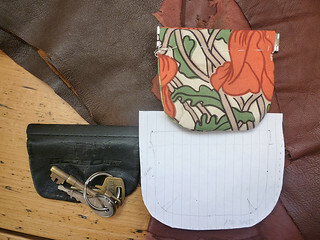 I’ve cut the external fabric larger than the pattern piece, adding allowances to adjust for a high or low arch. I’ll start by basting to the line of the original pattern, and work from there. I’ve discovered that this sort of hand-sewing is as safely executed as mindless spinning in the evenings while watching TV (unlike knitting the Orenburg lace scarf, which requires my full attention at all times). So I have another tiny project: to replace the little earbud pouch that A. finds invaluable for storing his keys in his pocket. It has a sort of flex frame opening: there are two thin strips of metal either side of the opening. Or were; one cut through its pocket and was lost, and the fake leather fabric is disintegrating. Real flex frames have hinges and are supplied with one closed and a pin for the maker to close the other. I’ve made a prototype, adding darts to create more space for the keys. Only minor adjustments are needed – it’s a little too deep, and might benefit from fractionally greater width (longer darts) so I will test the next version in leather. I have leather needles, I have linen thread, I have beeswax. Maybe tonight. This entry was posted in Uncategorized on January 2, 2015 by sarahw. I would like to sit across from you while your feet are propped up. 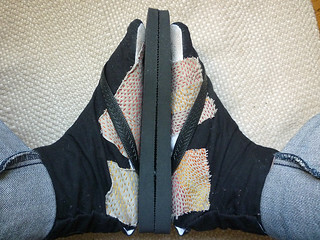 That way, I can admire the sashiko repairs. We should set up a mirror so you can also admire your sashiko repairs. What Gwen said. Also, I’d love to sleep under a sashiko quilt – faded, pale fabrics from my past, held together with swirls of shiny floss, protecting the old bedspreads and curtains hidden inside. You have the embroidery floss; if you have the fabric, you can do that. Look at the images Google finds for a search on ‘boro’; quilts, but not incredibly time-consuming geometries, just layer upon layer of fabric stitched together. It’s not exactly fast, but faster than you might think. I’ll add it to the list. As I’m sure you know, there are so many, so very many, wonderful things to do, but so little time in which to do them.